Pay 1000 Life Points to look at your opponent's hand. Select 1 card and discard it to the Graveyard. Among the 3 Hand Disruption magic cards, I think this one is the worst. Delinquent Duo gives you a 1 card advantage, and Forceful Sentry has no cost and makes the selected card harder to get back. That being said, Confiscation is still a good card. 1000 LP is definitely worth the effect of seeing your opponent's hand and eliminating a card that could have finished you off. Or, if you get this early in the game, it can prevent the opponent from getting a good start. I'd give this a 3.9/5. Although I believe Forceful and Delinquent are better, there's room for all 3 cards in a deck. Personally, I'd rather take the risk and possibly get card advantage out of Delinquent Duo rather than Confiscation. But that doesn't mean that they aren't worth playing together. Though, in most of my non-disruption decks, I usually won't run Confiscation and The Forceful Sentry due to space constraints. Disregarding the Life Point payment, heavy hand disruption decks love this card. And as we all know, it brings them closer to winning via Yata-Garasu. In Limited, it isn't overly playable. Rarely will your opponent be holding any massive threats for a period of time. But most importantly, the -1000 Life Points will definitely be your downfall in this format. -Not all decks rely on control…I guess? Personally, I see no legitimate reason to NOT play this card. It truly IS a staple “pre-negator” and is not left in the dust by Delinquent Duo and The Forceful Sentry. I always wish for this opening hand as my Firs card to play. Period. Well maybe pot of greed first and that’s it. Before you start to manage your hand and discard for graceful charity you need to know what your opponent has as options before you start making decisions. And, in addition with a delinquent or a drop off, something “disruptive” you can leave your opponent without staple needed cards that can ultimately turn the game in your favor from the very first turn. Besides, who doesn’t like having the 3 prenegs, a drop off, and a don/reaper T1? Well, at least back in the day I enjoyed this. Now, I’d probably just rather have card advantage with a pot and delinquent, and if confy ever becomes “unneeded” it is a great card to toss into a painful choice, likely to hit the graveyard so you don’t wasted a dead draw late game. The 1000 LP is prompting many people to drop Confy from their MDs and even SBs when running control because of the loss in one game due to trample, delinquent, scientist, etc. But in my opinion, the game isn’t won based on early Life Loss. The game is won based on advantage, and this gives you HUGE card advantage over your opponent. Now of course, if you go below 8000 then I guess LP matters huh -_- so don’t reach that point! Personally, I suggest keeping this in maindecked as it is so versatile in game one of the match. If you truly find is useless, then go ahead and side it out for a more useful choice. But go ahead, give Confy a chance, and don’t just hop on the bandwagon of those anxious to remove confy fro mall of their decks simply because someone somewhere said the card has been “replaced’. IMHO it is still a sure slot in any control deck I play for at least some time to come. Here is another classic card. Hand disruption A.K.A. 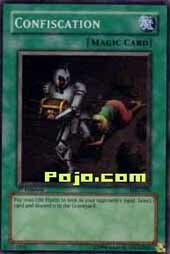 Control has been the top YgO deck since the debut of this card. I mean pay 1000 life, and get rid of what you feel is the best card in their hand. Its worth it, especially if you can get delinquent duo and the forceful in your hand as well. If you get those 3 in your hand its gg for your opponent basically. But yea, anyways, this card wins games. Oh, so your opponent had a sangan/witch? Hmm, I think I will confiscation that mon. Or, ooooh hmmm raigeki, good bye, never to be used. Sure some may think the 1000 lp is not a good idea to waste for this card, but trust me it is. Especially since ygo is all about topdeck. And what you can draw. Removing options is KEY. Well yea, there isn't really much to say about confiscation. Just that its good, and it will probably stay good. I mean, who doesn't like getting rid of their opponent's hand and removing the hugest threat in their hand? Plus you get to see what's in their hand so you can prepare for what they have. Confiscation, a really great card. Tourney Play: 4.5/5 I see this in every tourney winner's deck, hmmm pattern much? Casual Play: 3/5 this isn't really a fun card to play since its key in hand destruction. Limited play: 2.5/5 Not that great here, because the drafting might not get you anything good. So yea, I wouldn't take this card in draft. Well there you have it. Confiscation is a very looked over card. Art: 1.6/5 No holofoil (well hardly any) a Girl dragging the guy from the repo. depo.